With every other form of marketing on the internet becoming too competitive and difficult, one marketing strategy that will save you is content marketing. Your audience is dying to hear your voice and your story, and you’ve got to give it to them in an enchanting manner or you stand the risk of losing them to your competitors. In today’s internet marketing world, companies and businesses are defined by their unique voice and their story, and it’s only by creating compelling content that you can easily get your story out there and get your voice heard by thousands of people. However, getting started with your content marketing campaign can be an arduous battle if you’re not utilizing the right tools to get the job done. Now is the time to get serious about your business; think like a journalist and a marketer and offer your audience content that is both interesting, useful, entertaining, and actionable. This will also attract search engine visitors because Google likes sites that provide lots of value. In this post, I’ve assembled the 7 best content marketing toolkit that will help you create better blog posts and triple your search traffic. Curata is a very powerful marketing tool designed for anyone who wants to take his or her content marketing campaign to the next level. It does not matter whether you’re a newbie or a professional; you can do a lot with Curata. With the Curata content marketing platform (CMP), you can eliminate your content blind spots. Instead, you can create data-driven articles. Streamline your content production process. Analyze marketing and sales pipeline impact. Build a predictable content supply chain. Curata is currently being used by all the major players in the industry, and that is why these companies are always head and shoulders above the rest with their content marketing campaigns. Using their self-learning engine to discover the best materials on the internet. Easily organizing and contextualizing with just a few clicks. Effortlessly publishing and promoting your content anytime. Anywhere. The truth is, you absolutely need to test-drive this tool right away to see what impact it will make on your marketing efforts. This is my all-time favorite tool; I, along with many other successful internet marketers, could not live without it. 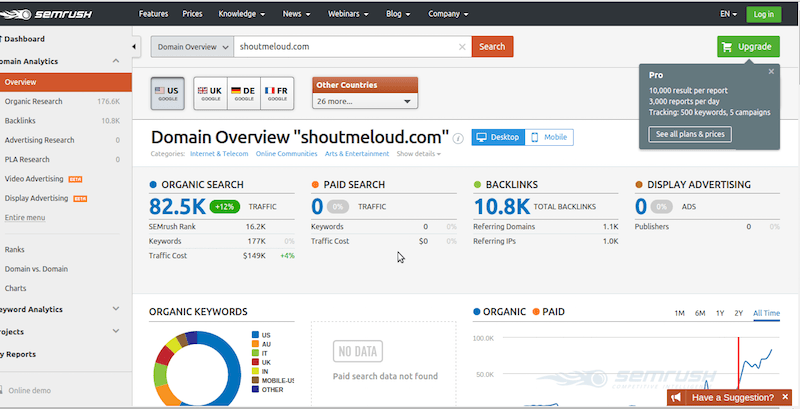 SEMRUSH will help you track your backlinks, your keywords, your brand mentions, and help you figure out the next move of your competitors. 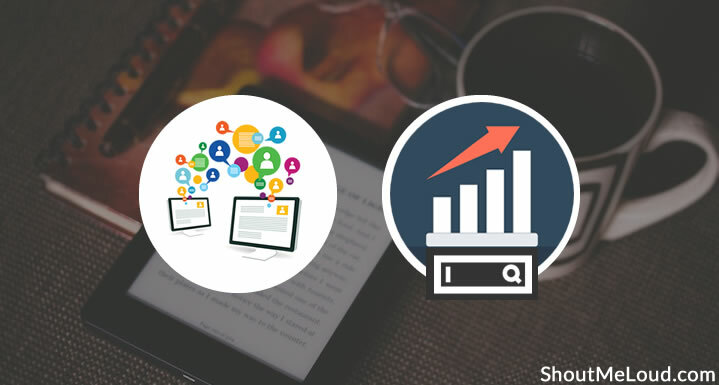 With SEMRUSH you can quickly determine the type of blog posts that are working in your niche so you will know how to position yourself to create better content, attract quality backlinks, rank higher on SERPs, and beat your competitors. This is one tool you should not neglect. With their 14 day free trial, you should check it out and see the miracles it will perform for you. This is a free tool from Google that will allow you to track several aspects of your content marketing campaign. I bet you already know how important it is to be keeping track of everything you’re doing; GA will enable you to find out when you’re doing it right and when you’re flopping. Which of your targeted keywords are driving the most traffic. What type of content is doing well for you. These metrics are super important as the answers will assist you to adjust your approach further later on. If you’re not familiar with Google Analytics yet, I urge you to start getting used to it now because it’s one of the tools you will need throughout your internet marketing journey. You can’t attain great heights without creating top-notch, high-quality material; it’s just not possible. Hemingway is a handy tool that will position you in the right direction, take you by the hand, and ensure you’re not creating crappy content. It will show you all the things you need to do so your articles will be worth reading and worth linking to. Consider it a content marketing “guider”. What this editor will do for you is identify problems with your blog posts, giving you tips and suggestions on the necessary steps to take to fix the problems before posting/publishing your content. Notice the readability score on the right sidebar? That’s one of the major things you should always pay attention to when editing your content with Hemingway. The higher the readability score, the better. You should be more comfortable publishing your posts after applying all the suggestions given to you by the Hemingway editor. The good news is that this excellent tool is free! Consistently creating epic content to inform, entertain, and educate your readers is definitely necessary, but is that all you should be doing? Let me tell you, dishing out lots of content is rarely enough; in fact, it’s just one side of the coin. After creating that informational material, you also have to get it to as many people as possible. If all you do is create content, then you need to work on your marketing strategy. But if you’re like me and have no time to spend on social media promotion, you’ll need help. What I love most about SocialPilot is its post scheduler. You can choose what and when you want to share and SocialPilot will automatically share your content across your social media platforms. They support Instagram & Pinterest as well. What makes me a fan of SocialPilot is the feature of sending recurring tweets. When ever I publish a new post, I schedule them to be tweeted 10 times in coming 2-3 months. This saves a lot of time & also helps in driving consistent traffic from social media. It doesn’t matter if you want to manage one or multiple social media accounts, SocialPilot will get it all done. BuzzSumo falls into the second type. It’s so helpful that I use it every day. Figure out the best performing content in any niche or industry. Find top influencers in that niche to promote the content. Anyone can use this tool as it does not require any particular skill. You just enter your keyword into the search box and the tool will take care of the rest. You can use this information to discover what content performs best for your targeted keyword so you can create an even stronger article and get it to outrank your competitor’s. After creating your material, you can also use BuzzSumo to see the people that shared and linked to your competitor’s content. You can contact those people and let them know you’ve got something better which they might also consider sharing and mentioning. In a nutshell, this is how BuzzSumo will help. I bet you already know the role that unique, compelling, and catchy headlines play in content marketing. Your headlines/titles are what will determine if a visitor will stop to read your blog posts or not. With Portent’s Content Idea Generator, you will never find it a daunting task to come up with a unique title for your blog posts. Simply type in your target keyword, and the tool will provide you with a variety of compelling, enchanting, and unique titles that will force anyone to stop over and read your post. If you’re not satisfied with the result, just click the refresh button and the tool will return another intriguing title. Start using the Portent Content Idea Generator tool today and knock off boring and ineffective titles from your blog posts. You don’t have to possess any particular skill before you can produce the type of content that ranks high in the search engines. You also don’t have to become a super human. You only need to make use of tools that will make the process easy for you. The Content Marketing Institute study of 2015 discovered that “about 30 percent of business2business marketers admitted they were effective at content marketing.” I bet you don’t want to be counted among the remaining 70%. Try out any of these tools today, and see what difference it makes on your content marketing campaign. Remember, you can’t see any result if you don’t take action, so you need to take the bull by the horns right now and become a winner! Which one of these tools do you like the best? Got another tool to add to this list? Let me know in the comments below!